4. What Role for Computational Approaches? Dr. José Medina-Franco received a Bachelor of Science degree in chemistry from the National Autonomous University of Mexico (UNAM) in 1998. That same year, he joined Procter & Gamble in Mexico City, working in the research and development department. He received a Master of Science degree in 2002 and a Ph.D. degree in 2005, both from the UNAM. In 2005, he joined the University of Arizona as a postdoctoral fellow. Dr. Medina-Franco was named Assistant Member at the Torrey Pines Institute for Molecular Studies in Florida in August 2007. Since then, he has conducted research and academic activities at the Institute of Chemistry, UNAM and Mayo Clinic in Scottsdale. In 2014, he was named Full Time Research Professor of the Pharmacy Department, UNAM where he leads a computational group focused on the discovery and development of epi-drugs. He also serves as an Adjunct Professor at the Florida Atlantic University. Dr. Medina-Franco has more than 8 years of experience working on molecular modeling of DNMT inhibitors. 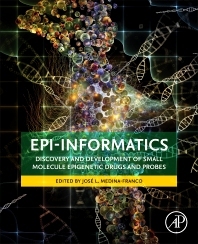 He has lead one of the first research groups applying computational tools for drug discovery of epi-hits. His research group has published several research papers, reviews and book chapters focused on the development of DNMT inhibitors using computational methods. One of the major contributions of his group has been the identification of a distinct DNMT inhibitor with a novel molecular scaffold. The hit compound has been used as a starting point for optimization programs and has served as reference for virtual screening campaigns. Dr. Medina-Franco’s group has also initiated a novel computer-guided drug repurposing project.